As with many of my compatriots, there are many things about Britain and the British people that I admire. As someone whose whole life has been linked with literature, cinema and theatre, I have the greatest appreciation for English literature and the arts, for its writers and playwrights, actors and directors. As someone who had the good fortune to have played the iconic Englishman Sherlock Holmes in a very successful Soviet film series, I was honoured to have been awarded an MBE by Her Majesty Queen Elizabeth II. I am grateful for a chance to have been part of the mutually enriching cultural kinship and synergy of our two countries. As someone who has lived a long life, I vividly remember the years of WWII when the Soviet Union and Britain were staunch and proud allies in the fight against Nazism. Many Russians feel an affinity with many things English – from pubs and gardens to Scotch whisky and Welsh singing and luscious valleys. Ascot races, Chelsea flower shows, London museums and Stonehenge – many will have been or at least seen them on TV. Perhaps surprisingly, many entertain a lively interest in the British monarchy and the Royal family, Russian television and papers carry stories about the Queen and her grandchildren and great-grandchildren. Flattering stereotypes of Britain still abide. But more and more this idyllic picture is being marred by the political developments of recent years. Today, as many of my compatriots, I am sad to see the state to which the relationship between our two countries has been reduced. While conflict situations can seldom be blamed on one party alone, I am convinced that the current deplorable and deepening crisis is primarily of London’s making. Please do not make the mistake of writing this view off as a casualty of devious Kremlin propaganda. On the contrary, the view I hold and share with the vast majority of Russians has been shaped and honed, paradoxically, by incessant anti-Russian propaganda emanating from London’s corridors of power and the media that seems to have lost all capacity for independent reasoning, at least for anything Russian. Many in Britain may be surprised that Russian audiences are kept well informed of the international media coverage, certainly insofar as it concerns their country. I do not intend to dwell on the long list of geostrategic and political differences between Moscow and London. Surely, each of side has its own interests and reasons for acting the way it does. Understanding these reasons is the job of respective governments and their foreign policy thinktanks. Manifestly refusing to understand those reasons is an abject failure of government. And that, I am sad to say, is exactly what I am seeing at the top of the British government and in much of the British press. What we have been witnessing is London’s – and, more generally, Western – consistent refusal to treat post-Soviet Russia as an equal partner in international affairs. The more hawkish Western capitals – notably, London – have been trying to condemn Russia to be the defeated party in the Cold War, and to behave like one. Mind you, this is a view taken by most Russians who are also increasingly convinced that the West’s attacks are not directed at Putin or the Kremlin, but at their country as such, at the people and state of Russia. Many will point to Crimea as proof of Russia’s aggressiveness and threat to world peace. But they should consider that Crimea, rather than being the cause, is a consequence of the total collapse of East-West dialogue in which London has played a significant role and often been the cheerleader. More importantly, it is, in the final count, down to the people of Crimea to decide where they want to be, certainly not to London or Washington. The accusations London has been flinging at Russia’s door fly in the face of every complimentary stereotype that Russians have of Britain and its allegedly gentlemanly culture. People at the top of the British government have been talking down to Russians as some kind of ‘lesser people’ in a language that invokes the less flattering pages of the not so distant British imperial history. PM Theresa May accusing Russia in the Skripals poisoning without any serious evidence was downright shameless. Foreign Secretary Boris Johnson likening Russia’s upcoming World Cup to Hitler’s 1936 Olympics was the ultimate insult – not only to Russia, but to Britain itself and the rest of the anti-Hitler coalition. Defence Secretary Gavin Williamson telling Russia to ‘shut up and go away’- does he even realise whom he is trying to bully? You can criticise Moscow all you want but it has never stooped to this level in talking to sovereign nations, big or small. Is an acute crisis in British education the reason for this excuse for statesmanship? What sort of policy do they think they are pursuing, what kind of world they are shaping? I feel genuinely sorry for Her Majesty the Queen that she has to call this government her own. The current explosion of Russophobia and anti-Russian hysteria in Britain has no precedent in living memory. Not even the Cold War saw such blatant disregard for the norms and conventions of inter-state diplomacy. Anyone who calls for a meaningful engagement with Russia is branded a dangerous radical or traitor. People who even agree to talk to the Russian media are ostracised and side-lined. Anyone who simply calls for restraint or caution is vilified as a Putin puppet. Is there a name for it already? Un-British activities? A curious yet deeply troubling throwback to the McCarthy era in modern-day enlightened Britain. It’s hard to escape the timing of this latest chapter in London’s lengthy anti-Russian saga with a crucial stage of the North Stream 2 project, the football World Cup and of course the recent presidential election in Russia. Which only goes to show that the instigators are quite ignorant of what the Russian people are like. Any hostile moves from the outside will unite us, we come together and find a response. They wouldn’t have attempted it if they knew the first thing about what makes Russia tick. They have to realise that in their poisonous campaign they are engaging not just the Kremlin or Putin, they are taking on the whole of the Russian people, including its political class and business elite. We have no beef with the people of Britain. From what we can glimpse, more and more of them are sceptical of the anti-Russian propaganda spewed by the hawks in government and much of the media. The current cold winds will die down and our two countries will revert to a civilised and respectful relationship which has so much to offer. As a proud recipient of the Most Excellent Order of the British Empire I aspire to wise and dignified British statesmanship that will make it possible. Vasily Livanov, is a legendary Russian actor, director and novelist, born in 1935. 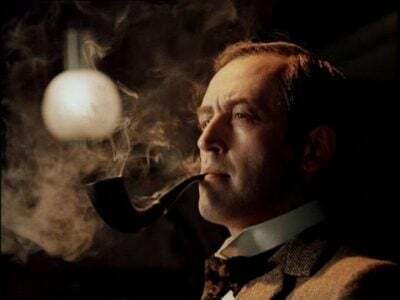 He was awarded an MBE by Queen Elizabeth in 2006 for his exceptional portrayal of Sir Arthur Conan Doyle’s Sherlock Holmes in the hugely successful Russian film series The Adventures of Sherlock Holmes and Dr Watson.